Pictured: Stephen Dawkins, Chief Operating Officer, Air Logistics Group (centre) receiving the GSSA of the Year award from Graeme Ferguson, Commercial Director Cargo, M.A.G. 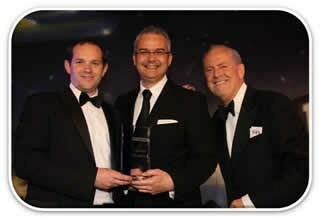 Manchester Airports Group (left) alongside host Gyles Brandreth (right). On the 26th April 2014, the 31st Annual Cargo Airline of the Year Awards took place at a glittering event at London’s Lancaster Hotel hosted by the BBC’s Gyles Brandreth. Air Logistics Group was awarded best in class and winner of the worldwide ‘General Sales and Service Agent (GSSA) of the Year' award for 2014. The Cargo Airline of the Year Awards are the world’s oldest and most respected air cargo awards, and in 2012 the category for ‘GSSA of the Year’ was added to the awards list recognising the achievements of GSSAs in the global air cargo industry. “We place great emphasis on local knowledge and understanding the local market,” adds Dawkins. Air Logistics Group has a comprehensive worldwide network of 71 offices in 46 countries across 6 continents. Celebrating almost 20 years in the air cargo industry, this global organization has moved on significantly from the traditional ‘General Sales Agent’ that was established back in 1994. Air Logistics can provide a variety of cost effective cargo solutions to its airline partners, from turn-key total cargo management to cargo sales in niche markets around the globe. The development of Air Logistics Group over recent years has been significant, and with the support of institutional investors, the Group now has a turnover in excess of $500 million with cargo volumes equal to some of the largest airlines in the world.